Oct. 29, 2010 – The best junior hunters in the nation went head-to-head today in their respective divisions to determine championships at the 52nd Washington International Horse Show. California was well represented in the awards presentations. Olivia Esse of Los Angeles, CA, rode Illusion, owned by Oscany, Inc. to the Grand Junior Hunter Championship after they topped the Small Junior 15 & Under Hunters. Hannah Goodson-Cutt of Beverly Hills, CA, won both of the older junior hunter divisions on Caretano and Superman. Shawn Casady of Midtown, TN, rode Cachet, owned by Caroline Spogli of San Diego, CA, to the final junior hunter division championship. Olivia Esse and Illusion were very successful in the Small Junior 15 & Under Hunters. Their first, second, and third places over fences and second under saddle gave them enough points to also garner the Grand Junior Hunter Championship. The reserve champion was Falcao, ridden by Hasbrouck Donovan and owned by Donald Stewart. They placed first and second over fences. For their Grand Junior Hunter Championship, Esse and Illusion were presented with the Ides of March Perpetual Trophy donated by Linda Lee and Lee Reynolds. This is Esse's first championship at the WIHS. “It feels really great. I am so glad that the California people did really well this year. In the ponies it was impossible to beat the East Coast girls but I feel like now it is a little more evened out,” she said. Hannah Goodson-Cutt contributed half of California's championship haul with her horses Caretano and Superman. Caretano, a 12-year-old Holsteiner gelding, was the champion in the Small Junior 16-17 Hunters. They won the handy hunter and stake classes and were fourth in the remaining over fences class. The reserve champion in that division was Ruby, ridden and owned by Holly Labry of Memphis, TN. They were second and third over fences and second under saddle. Caretano has had a great fall circuit with the grand championship at Capital Challenge and a championship at Harrisburg. Coming to Washington, Goodson-Cutt's preparation was a little different. In the Large Junior 16-17 division sponsored by The Wasserman Foundation, Goodson-Cutt and Superman were champions with first and fourth places over fences and they won the under saddle. Truly and Ashley Pryde of Medina, WA, were the reserve champions with a first and second over fences. Superman and Goodson-Cutt were presented with the Chance Step Perpetual Trophy, donated by Brooke Carmichael McMurray-Fowler and Pam Carmichael Keenan. She added that it “absolutely makes winning more satisfying.” “I feel a lot more satisfied on one that you have to actually ride rather than one you just have to point at the jumps and go,” she said. Although Shawn Casady hails from Tennessee, the 10-year-old Warmblood mare Cachet kept the California vibe alive when she and Casady won the Large Junior 15 & Under championship for owners Caroline Spogli and Cavallo Farms of San Diego, CA. Casady piloted Cachet to first place over fences and third place under saddle for the division championship. Walk the Line (owned by O'Mara and Donald Stewart) and Abby O'Mara of Rumson, NJ, were the reserve champions after they placed first and fifth over fences and fifth under saddle. In the opening hunter phase of the WIHS Equitation Finals, Molly Braswell finished in the top spot on The General. Lillie Keenan is in second place and she rode Uno. Michael Hughes on Coco Pop was third. The top 30 junior riders return for their jumper phase tomorrow, and the final top 10 will ride in a work-off in the evening session. 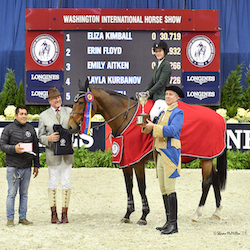 The Washington International Horse Show continues tomorrow with the opening classes for the pony hunters, followed by the WIHS Pony Equitation Classic Finals. The Amateur-Owner and Junior Jumpers will close out their divisions, and the Open Jumpers will have a pair relaty class. The jumper phase for the WIHS Equitation Finals will close out the afternoon session. The evening session begins at 7 p.m. with the WIHS Equitation Finals work-off with the top 10 riders, followed by a Caisson presentation, terrier races, Chester Weber driving exhibition, and the highlight class of the week, the $100,000 President's Cup Grand Prix presented by Washington Convention and Sports Authority, a World Cup qualifying event. Photo Credit: Photos © Jennifer Wood Media, Inc. Illusion and Olivia Esse jumping photo © Diana DeRosa. These photos may only be used in relation to this press release and with full photo credit.